But I found a couple of other sites I like that have trendy items at great price points that I’d thought I’d quickly share those pieces. Oh and sorry I am not ‘ modeling’ these… this baby is really, really large and totally in charge. Things do not look quite that flattering on me anymore!! But I’m ok with it! !<3 OH! And this is in no way form or fashion a sponsored post. I wanted to do something a little different. 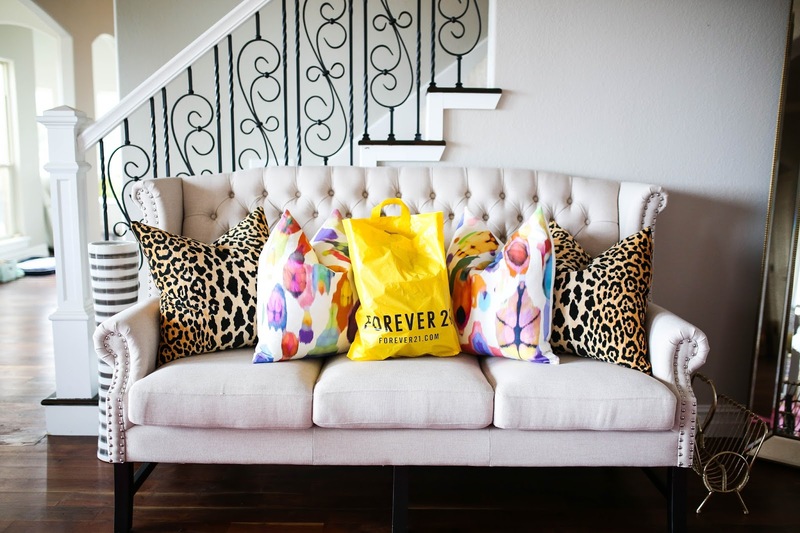 ^these pillows are available HERE & settee HERE. Rag & Bone shorts are from past seasons – this seasons are HERE. (these are designer & HIGH quality.. Ive had mine for years and wear them like crazy). 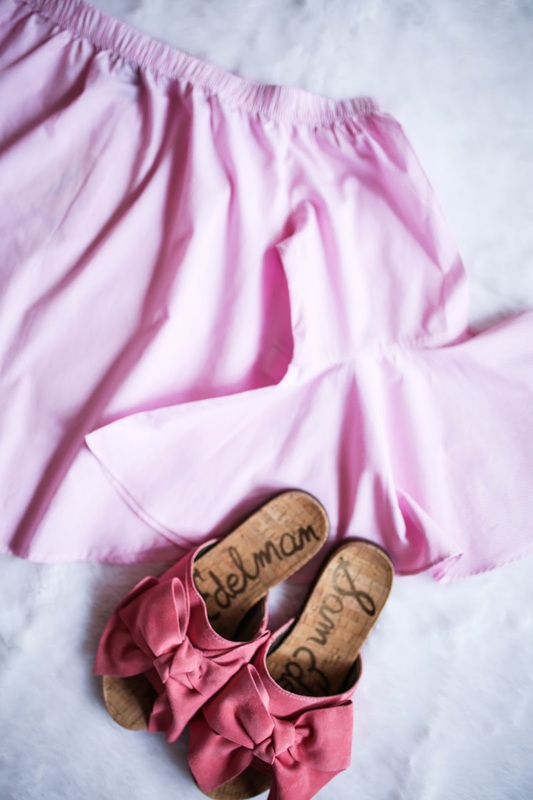 Pink bow slide sandals HERE. One of my FAVE online shops is Chicwish – I am obsessed. I think they have the cutest clothes – w/ the best quality – and the best price points. No, they aren’t $25 or under, but they are much better quality and I wash and re-wear their stuff a ton! 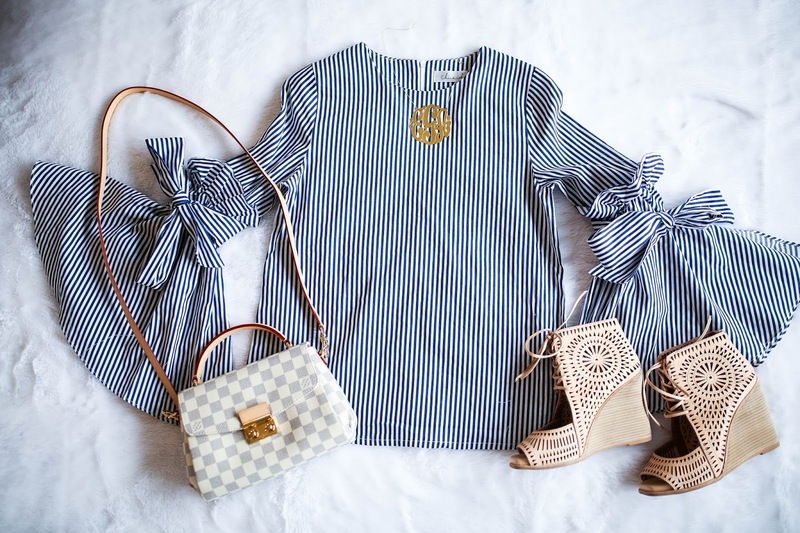 Striped bell sleeve bow top is HERE. 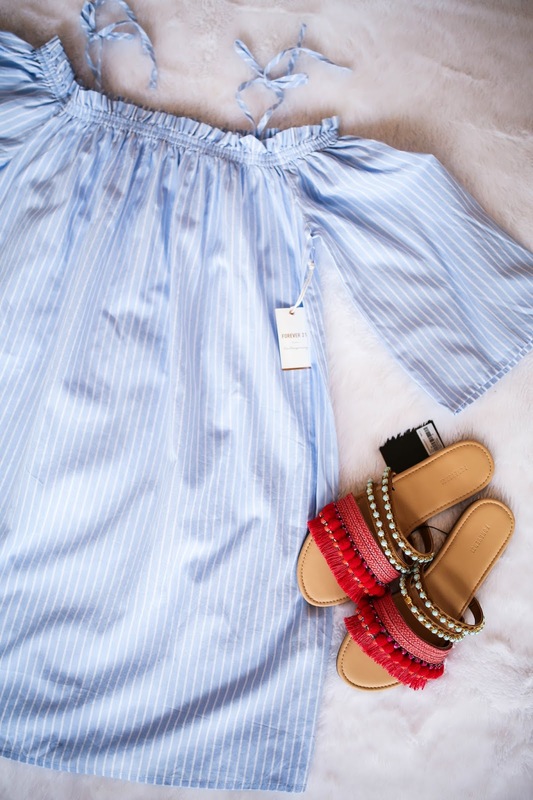 Off the shoulder striped dress w/tie on shoulder is HERE. This dress works well w/ my bump and I got a medium. Runs large. This dress is another Chicwish find. I was hoping it would work w/my bump but no way jose. 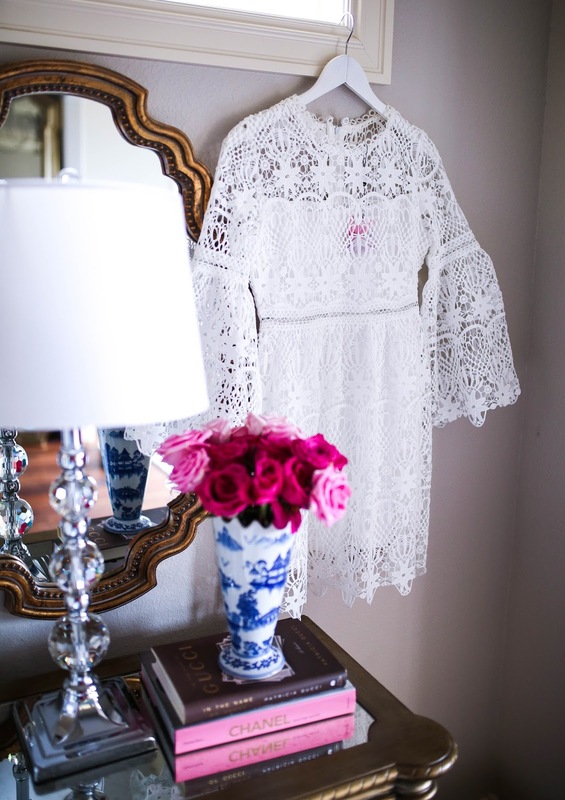 The white lace dress is available HERE. 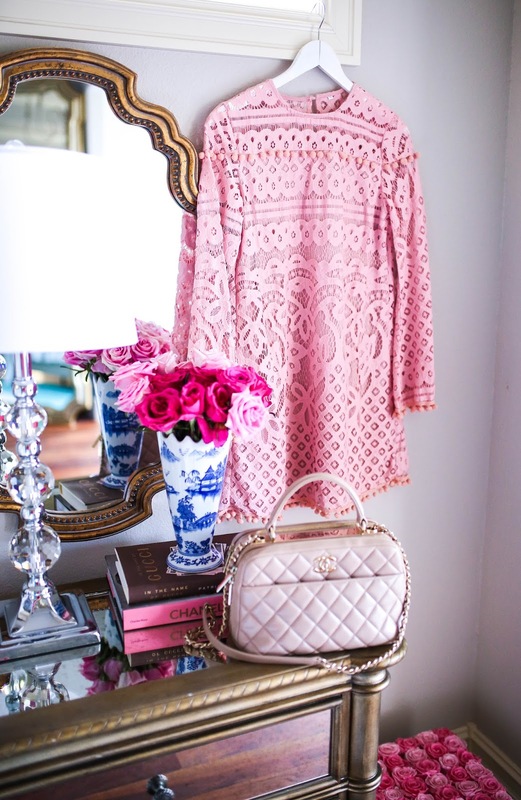 The pink pom dress is available HERE. The medium actually fit over my bump (which is massive) but was too short in the front. SO I would say it may run a little big! How cute is this bag from F21?!!? 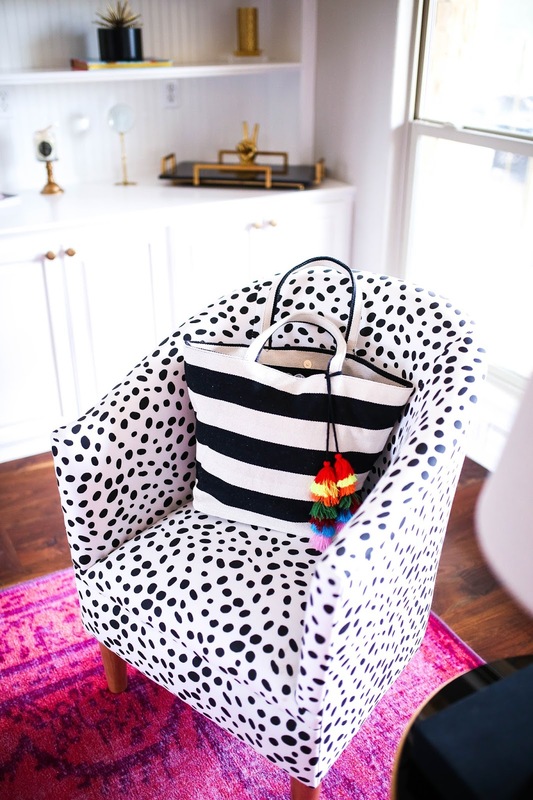 I think it’s perfect for the lake or beach… or work. Just take off the tassels if you want to calm it down a bit! Your new blog layout is fantastic. It’s really so beautiful, emily. Also – loving that pink dress. Love all these affordable finds! Those sandals are sO DARN cute! Need them! awesome finds! love the dresses. Yaaaaay!! I can finally get on your blog!